Is Steam Really Enough To Get Good Espresso? There was a time when I woke up very early in the morning, every morning, to unlock the doors of a coffee shop and serve up a caffeine fix to sleepy people all across town. I made a mean cappuccino and an even better latte. And my mochas? Yummmm! The only problem was that by the time I moved on from my position at the coffee shop to bigger and better things, I hated the smell and taste of anything coffee related, including espresso. Well, that was many, many moons ago. I finished college, got a big kid job where I work way too many hours, and realized I need a really good caffeine fix to get me going in the morning. Caffeine is a great substitute for not having enough sleep, right? Well, after spending a not insignificant amount of time trying to find good coffee, I realized I was wasting a lot of money trying to find one I liked when I could just make one myself. So I embarked on the hunt for the best espresso machine so I can get to saving money instead of spending it. The problem is, even though I know what kind of amazing espresso machines money can buy, I’m still not sure I want to spend it. 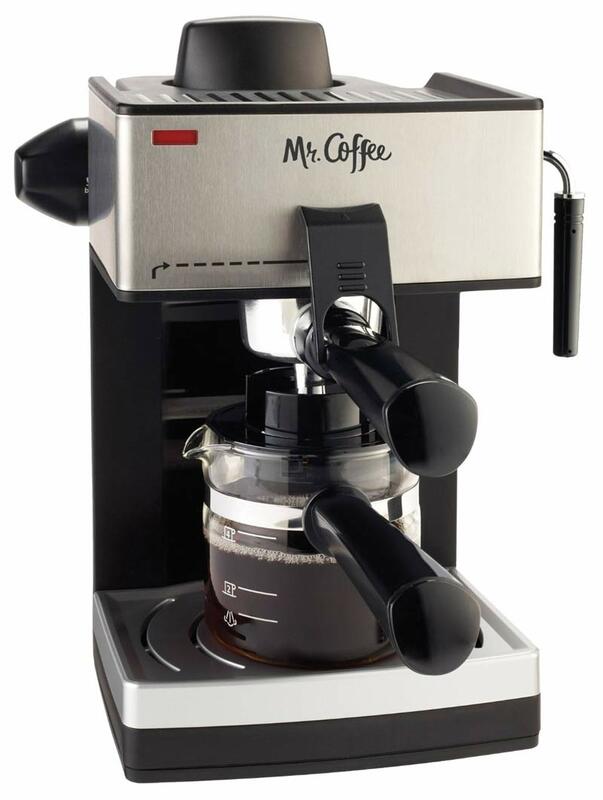 Cue the Mr. Coffee ECM160 4-Cup Steam Espresso Machine. At around $40, it’s no more than an entry level coffee machine as far as price goes, but it does a lot more than most entry level machines as far as the drinks are concerned. A lot of espresso machines brew only per shot, which means you have to wait a little bit longer to get multiple shots for one drink. This one will brew up to 20 ounces at a time, but that is a whole lot of espresso, and you probably wouldn’t be making that much at one time unless you have a thirsty crowd in your living room. Even though this machine has fewer options than some, it still has a milk steamer to make sure you can get a little more volume and heat into the milk that finishes off your drinks. This is not a simple little splash of milk for your coffee, either. No, we’re talking about the 3 out of 4 fancy coffee drinks that have espresso on the very bottom. Actually, it can. Most espresso makers brew directly into the cup or into specialized containers. This one kind of does that, but only because it has an actual measured decanter, which is pretty handy. You can see exactly how many ounces of espresso you made so you know how much milk to put in your drink, but you can also use it to divide larger quantities of espresso (20 ounces, anyone?) over several cups. Pretty handy! 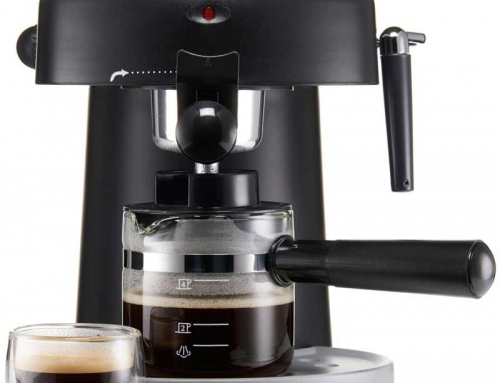 Like most other consumer espresso machines, you will need to either get a coffee grinder or buy pre-ground espresso. You have to put the grounds into the receptacle and tamp them down, and then, obviously, empty them when you’re done. That’s not much different from other machines, but it may take you a little time to get used to depending on what you’re already used to. This is a steam espresso maker, which works differently than the more expensive units, but it will still make passable espresso for those who are not too picky. It requires steam to work, obviously, and steam creates pressure. One would think there should be some sort of valve or return on one of these machines so the steam has a place to go and not just build up in the machine. There have been, however, some reports of this machine being unable to handle the pressure after some time, resulting in the machine exploding. If you’re standing near the machine when it happens…um…yeah, that could be pretty bad. This machine has a lot going for it, but I have to put on the brakes when I hear of possible injury. I mean, I know it doesn’t happen often, but with my luck and my forgetfulness, I need things that are idiot proof. If there is a way to injure myself, I will find it, so I’m going to back away from this one. Now, if you’re more cognizant of what is going on around you then I am, you probably have much less of a chance than I do of having an issue with this machine. If you like rolling the dice and the possibility of living on the edge, this is the perfect low budget machine.